After 5 rounds of play the Thailand Open Chess Championships 2014 / 14th Bangkok Chess Club Open, taking place in Bangkok 12-19 April 2014, is well under way. As in 2012 this year’s tournament is hosted by the beautiful 5-start Dusit Thani Bangkok Hotel, which is located in Bangkok’s business district Silom. During the last few years the BCC Open has been hosted either by the Dusit Thani Bangkok Hotel or by the Dusit Thani Pattaya Hotel. Thanks to the great cooperation with these outstanding venues, the BCC Open one of the most attractive chess events in Asia, with established a loyal base of strong amateurs and professionals, and keeps attracting new players from around the world. As is tradition the tournament features an Open (9 rounds) and a Challenger (7 rounds) category. With over 200 players in both categories combined, the tournament has again drawn a big and internationally diverse crowd. The number of participants is lower than a year ago when the tournament took place in Pattaya, which may be due to some players’ concerns about lingering political tensions in Thailand. Nevertheless, the first half of the tournament has shown that the chess is as strong and the event is as competitive as ever. The Open section includes a tough field of 55 titled players (! ), among them 13 grandmasters and 12 international masters. Obvious favorites for the title are first-seed GM Francisco Vallejo Pons (Spain, ELO rating 2693, =1st place in 2011), GM Bartosz Socko (Poland, 2635), and GM Jan Gustafsson (Germany, 2634, winner in 2011, 3rd place 2013). Their closest rivals GM Oliver Barbosa (Phi, 2580) and GM Suat Atalik (Tur, 2562) certainly also have a shot at the championship. GM Zong-Yuan Zhao, last year’s champion and Australia’s strongest player, has not returned to Bangkok to defend his title. Notable is the solid number of female players fighting for accolades in both categories. The strongest among them this year are GM Monika Socko (Pol, 2450), WGM Anda Safranska (Fra, 2286), WGM Xiaobing Gu (Chi, 2265), IM Nisha Mohota (Ind, 2253) and WGM Kulkarni Bhakti (Ind, 2246). For the first time in several years British GM Nigel Short, winner in 2012, is absent, yet with veteran GM Eugenio Torre (Phi, 2427), Asia’s first GM, one of the world’s strongest players of the 1970s/80s and the most successful player to herald from the Philippines, the BCC Open has welcomed back an outstanding veteran of the sport. Torre reached second place in the 2005-edition of the tournament, and with his great experience he can beat any of the younger masters of today. The Philippines is the nation with the strongest representation in the Open section. Alongside Barbosa and Torre, other Filipino players are battling for ELO points and good results. They include GM John Paul Gomez (2524), GM Darwin Laylo (2511), IM Rolando Nolte (2417), and a good dozen of their countrymen. Thailand’s strongest players FM Jirapak Pitirotjirathon (2274), Uaychai Kongsee (2271), FM Wisuwat Teerapabpaisit (2250) and FM Boonsueb Saeheng (2200) are also participating. While they may not have the consistency to break into the top ranks, they all have the ability and experience to beat higher rated opponents. After four rounds GM Francisco Vallejo Pons, GM John Paul Gomez (Phi, 2524), GM Suat Atalik, and GM Gerhard Schebler (Ger, 2451) were the remaining players with a clean sheet. In hard-fought battles, the former two players drew their game, while in the latter encounter GM Atalik kept the upper hand against GM Schebler in a marathon match. His win in round 5 has made GM Atalik, the second seed of the tournament and Turkey’s second strongest player, the sole leader, confirming his role as a favorite to win the tournament. Yet much can still happen in the remaining four rounds. The competition is heating up and the stakes are high. GM Atalik is on a roll, but now he is facing top-seed GM Vallejo Pons, who will do everything to stop him. In the first three rounds of the Challenger category, only 3 players won all their games and are leading the standings: Arnulfo Gavilan Jr. (Phi, 2031), Behrang Kaboodi (Iri, 2064) and Buragohain Nandan (Ind, 1924). The top encounters of round 4 are Gavilian vs. Kaboodi and number one seed Ko Khin (Mya, 2087, 2 ½) vs. Nandan. Players and visitors of the BCC Open can follow the top four boards live on a big screen in the playing hall, which is a much appreciated addition to the event. 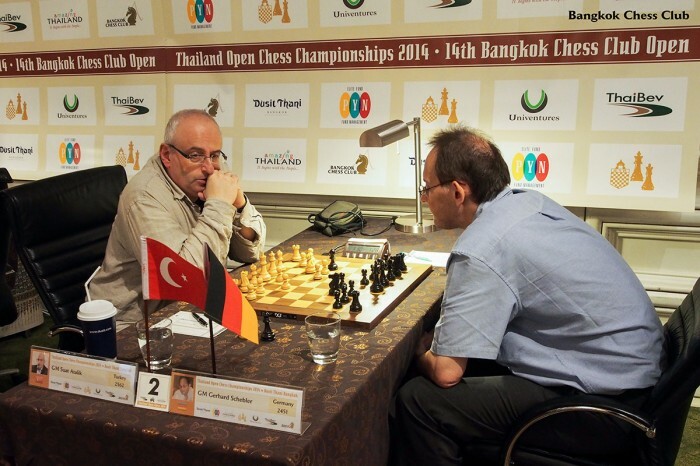 Visit www.bangkokchess.com for PGN files of the games and further updates about the playing action. And if you can read Japanese, check out Shinya Kojima’s lengthy blog.